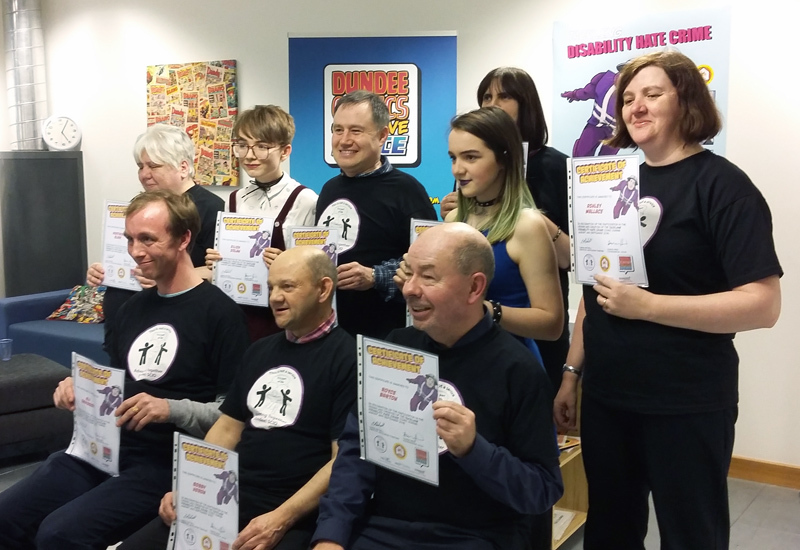 The Tackling Disability Hate Crime comic was launched with an event at DCCS on December 21st. Representatives from DCCS, Advocating Together, The Rank Foundation, Police Scotland, and invited guests were in attendance to help cut the cake marking the culmination of months of work producing the comic. 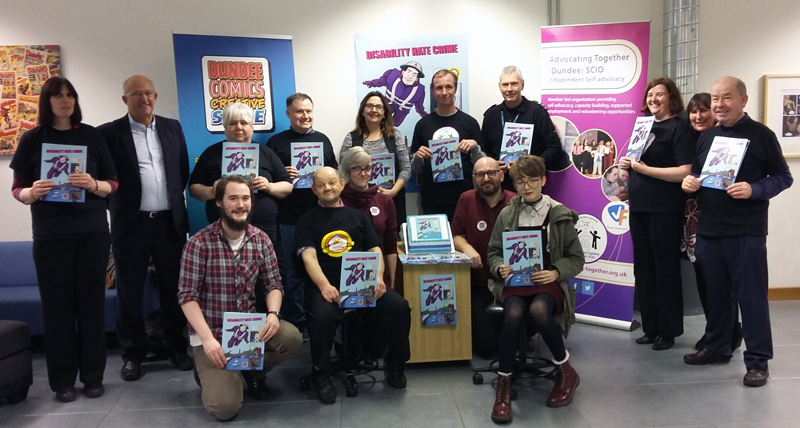 The comic was created by artists and Comics Clubbers at DCCS in collaboration with a group from Advocating Together Dundee and the Dundee Safe Place initiative. It demonstrates examples of disability hate crime, and then gives advice on what to do if it is experienced. This includes reporting to the Police and using Keep Safe places. You can download a digital copy of the comic at the Advocating Together website. The local press were also in attendance and there was a great feature in the Evening Telegraph just after Christmas. Comics Clubbers and Advocators receiving certificates. Posted on January 5, 2017 January 5, 2017 by dundeecomicscsPosted in charityTagged advocating together, charity, comics, Comics Club, disability, evening telegraph, hate crime, keep safe, the advocators. 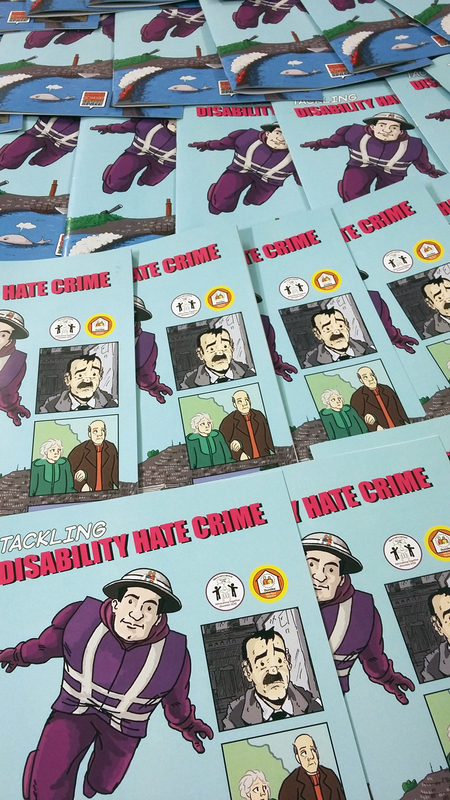 Over the last few months our Comics Clubbers and artists have been collaborating with local charity Advocating Together to produce a comic looking at disability hate crime. This 12-page comic highlights particular examples of hate crime, and gives information on what to do if you experience these crimes. This includes using Keep Safe cards, which give information and emergency contact details of the holder. 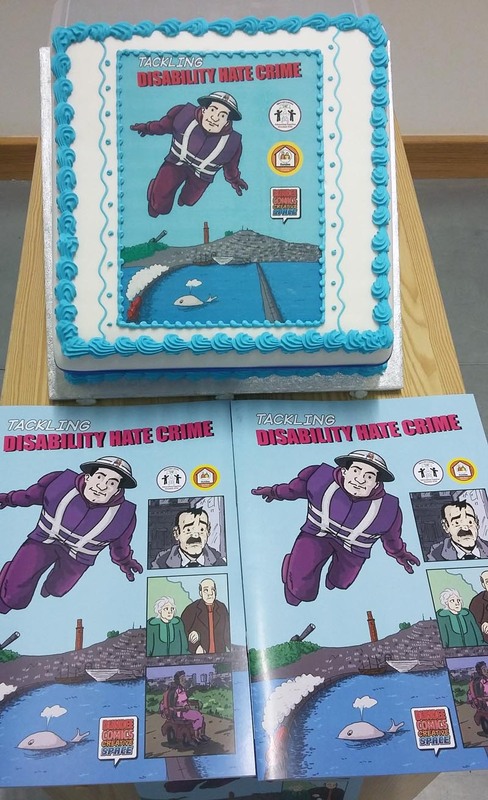 We are very pleased to be hosting the launch of the Tackling Disability Hate Crime comic at DCCS HQ today. If you would like to pick up a copy, please contact Advocating Together. Posted on December 21, 2016 December 21, 2016 by dundeecomicscsPosted in comicsTagged advocating together, comics, disability, dundee, hate crime, keep safe, superheroes, the advocators.